Two separate research groups are working on ways to automatically disperse drugs into the human body as soon as they are needed. In August, a team of engineers at the University of California – Berkeley published a paper in the journal Neuron to announce the development of, and continued research, on tiny, millimeter-size wireless devices small enough to be injected into individual nerves. The devices (“neural dust” gives you some idea of the size) are programmed to detect electrical activity in the body’s nerves and muscles via ultrasound so that they could stimulate the body’s own therapeutic reactions. 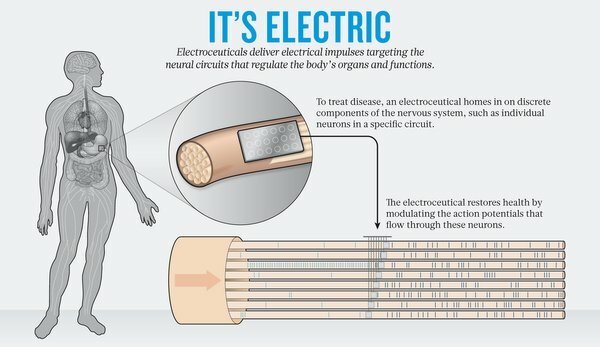 The Berkeley team is being funded by DARPA’s Electrical Prescriptions (ElectRx) program to create technologies that can sense and modulate peripheral nerve targets. 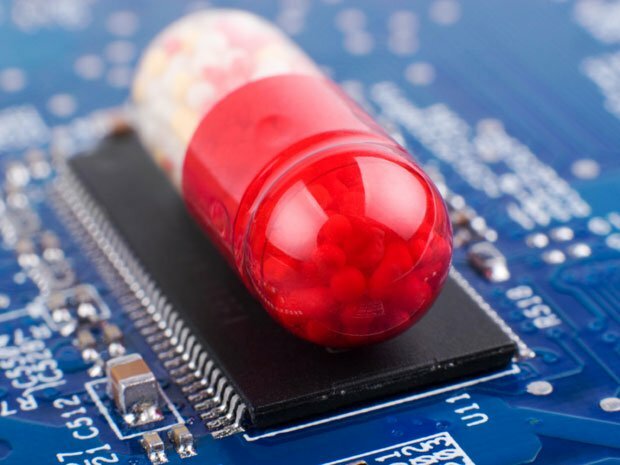 DARPA is spending $79 million on ElectRx, and researchers predict that this new technology will turn some pharmaceutical companies into bioelectronics companies. The first electroceuticals have been approved by the FDA – a device that treats sleep apnea by stimulating airway muscles and a device for morbidly obese patients that stimulates the vagus nerve in order to make them feel full. Meanwhile, a team in Israel is building nanobots out of DNA for a similar purpose These nanobots are shaped to fit a drug securely inside until the point when and where it is needed by the body. Preliminary tests on cockroaches have shown that a person wearing an EEG cap to measure brain activity can indeed control the DNA bots (that is, open or close them) by either doing mental arithmetic or letting their brain rest. Researchers hope that eventually human brain activity will automatically trigger the release of a drug in the human body. The brain won’t just signal an “on” or “off” in these future nanobots, but will also be able to detect brain states that underlie ADHD, schizophrenia, depression, and other hard-to-diagnose conditions. In the case of schizophrenia, when noncompliance with medication can be very serious, a patient’s brain would recognize the signs and signal to the DNA bot that it was time to release the drug. Because the bots can open and close when required and only target specific cells in the body, side effects and harmful interactions should be minimal. If these researchers are successful, we could someday have these tiny bots implanted all over our bodies to detect the first signs of disease. They are already being eyed by researchers and physicians who want to use them for mental illnesses like depression and schizophrenia (which are difficult both to diagnose and to treat). Ironic, since there are not yet ways to predict or diagnose them biochemically. There are many conversations to be had about this unique combination of medicine and engineering. To what extent will physicians be involved in the development process? How might pharmaceutical companies become involved? Getting medical experts on board now would also allow researchers to address some questions about how this tech will discern what a “normal” level of anything in the body should be. Are engineers working too far down the line, making the assumption that diseases always come with a biochemical warning sign? And what about recreational use? Theoretically, the “neural dust” can trigger the release of endorphins, but how much is enough? Nanobots can be signaled to release more and a therapeutic amount of a drug. Can this technology be abused just as easily as prescription medication? As always, it’s important to think about how this technology will be distributed throughout the world. Even if we manage to make a medically unproblematic breakthrough, it will be expensive (at least at first) and require specialized training to administer. Who will have access to a technology that aims to solve your health problems before they even begin? Or, perhaps more importantly, who won’t?